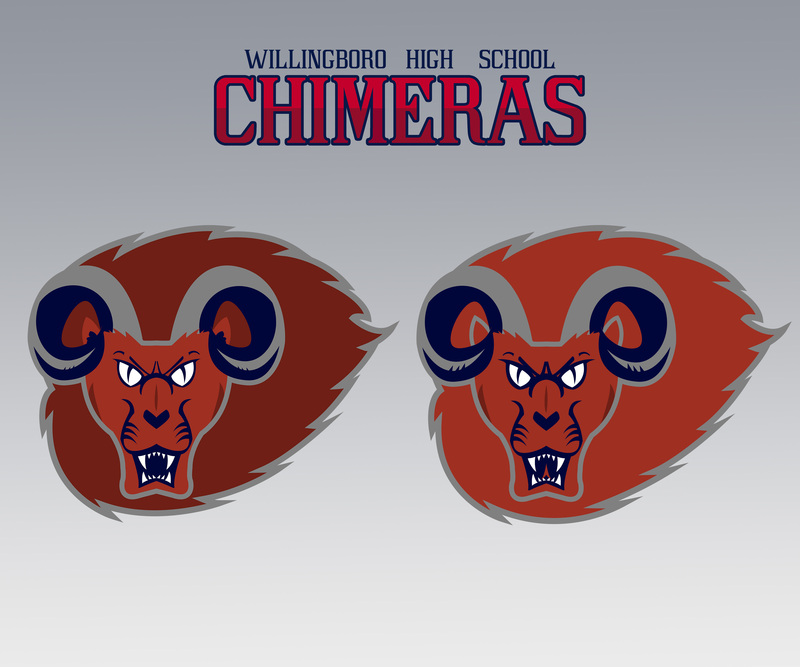 I'm making a concept redesign of the Willingboro High School Chimeras. I thought the mascot was very unique and would be challenging. i was kind of in the dark because there aren't many teams with this name. 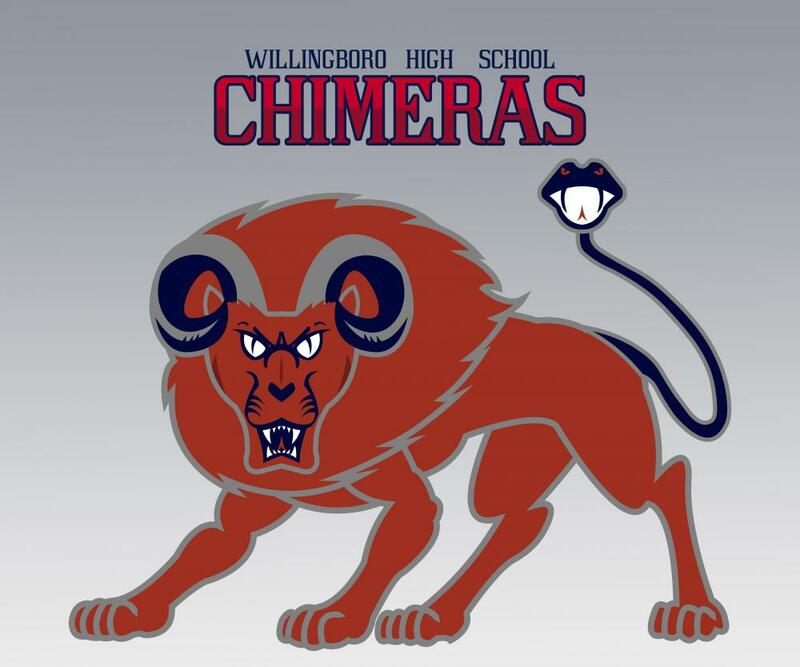 The current logo is very outdated and you can't really tell what the face is ( a chimera is a mythical animal made up of a lion, goat, and snake). I'm planning on doing a full body logo and other partial logos. Any tips and feed back wanted. *Because you've got blue for both the horn shadows and the inside of the ears, where they meet gets a little confused. *The ridges on the horns are so small that they might as well not be there--either drop them or make them significantly larger. *The wrinkles around the eyes and nose are likewise too fine; I'd bump up the line weight. *You have an awkward tension point where the mane almost meets the corner of the jaw; move the outline of the mane further from the jaw. 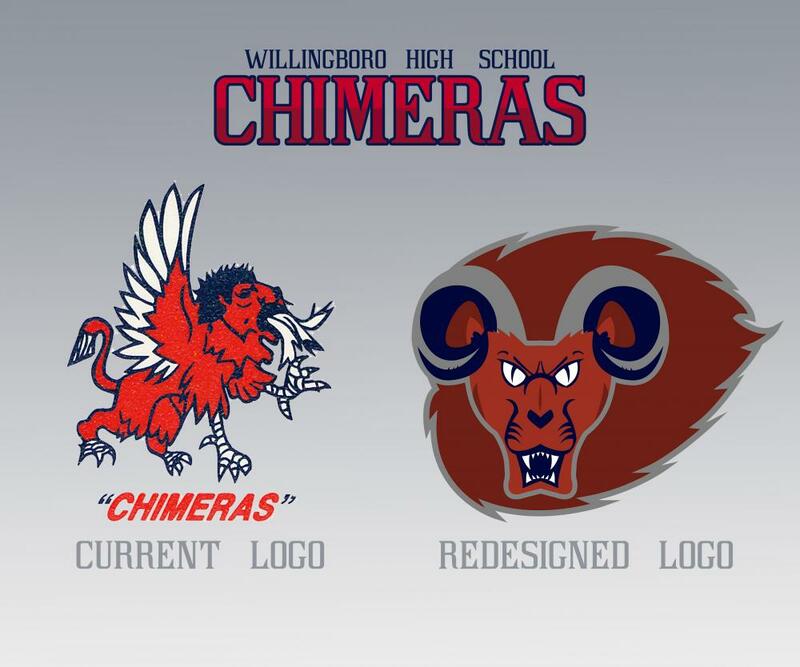 *Finally, I'd experiment with just using one shade of red, since that would be truer to the aesthetic of high-school logos. I like it so far. I agree with PackerFan that it needs something coming out of its mouth like a snake tongue, or maybe even some fire. I added the updates on the right side. any ideas for the full body and any helmet ideas? Greatly improved. But there's still something off with the ears, in part because they're so tiny, in part because their placement just doesn't make sense relative to the chimera's skull. It's a made-up creature, but some principles of anatomy still hold. Not sure what to do about that. 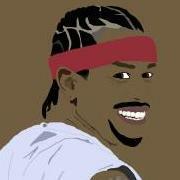 Also, you've still got a couple of touches of dark red in the new logo. I just randomly saw a photo of a hyena and rescind my comment about the ears. do you think the snake looks good?